The unique ultraviolet vision of NASA's Galaxy Evolution Explorer reveals, for the first time, dwarf galaxies forming out of nothing more than pristine gas likely leftover from the early universe. 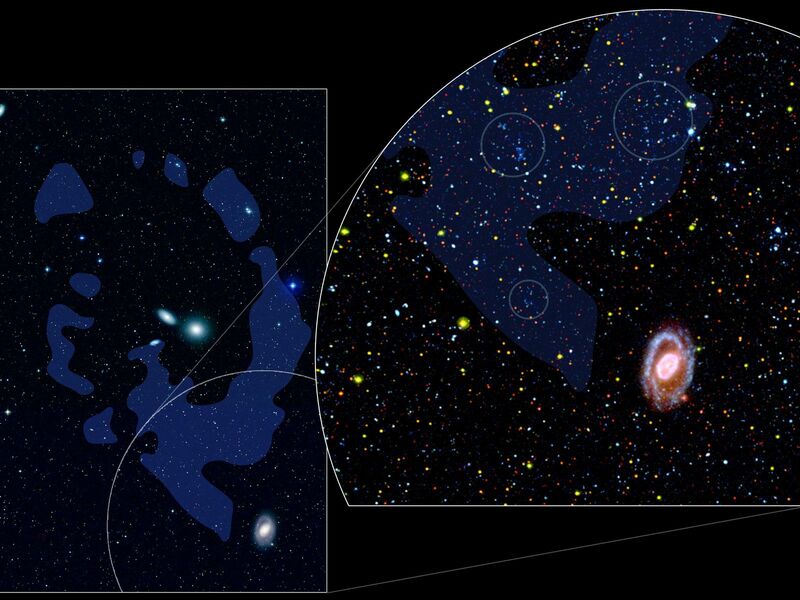 Dwarf galaxies are relatively small collections of stars that often orbit around larger galaxies like our Milky Way. 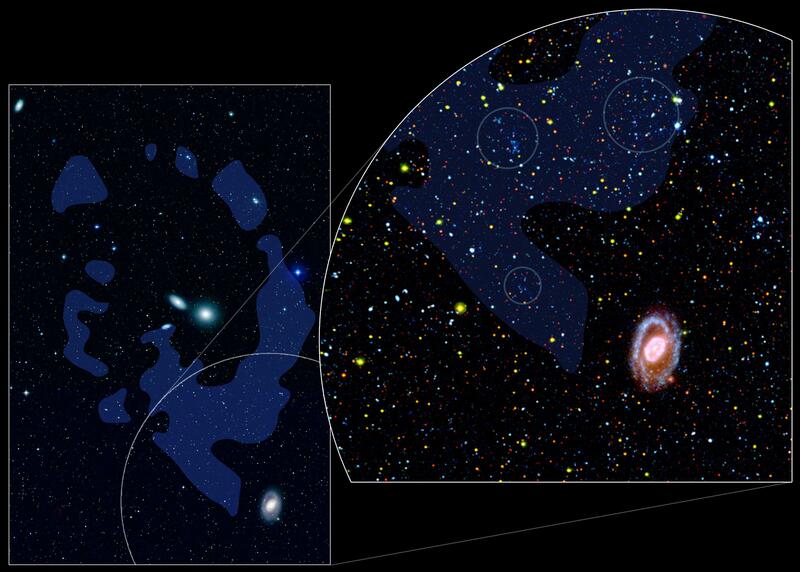 The forming dwarf galaxies shine in the far ultraviolet spectrum, rendered as blue in the call-out on the right hand side of this image. Near ultraviolet light, also obtained by the Galaxy Evolution Explorer, is displayed in green, and visible light from the blue part of the spectrum here is represented by red. The clumps (in circles) are distinctively blue, indicating they are primarily detected in far ultraviolet light. 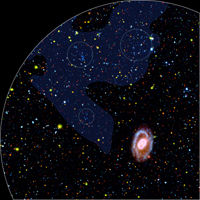 The faint blue overlay traces the outline of the Leo Ring, a huge cloud of hydrogen and helium that orbits around two massive galaxies in the constellation Leo (left panel). 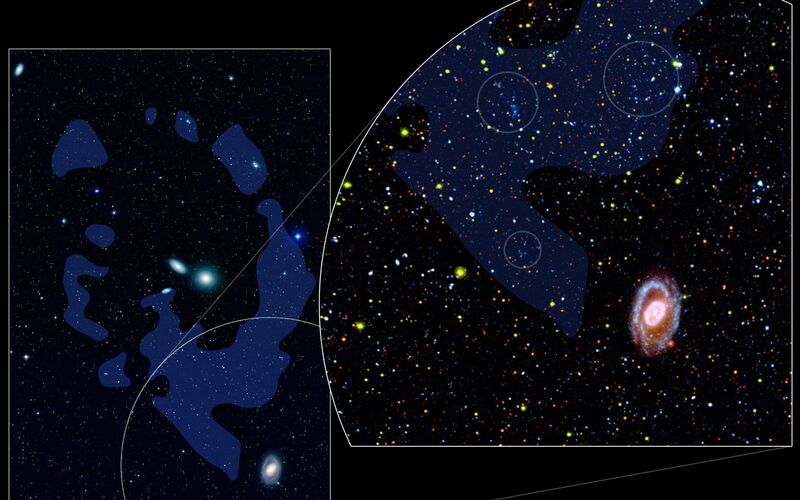 The cloud is thought likely to be a primordial object, an ancient remnant of material that has remained relatively unchanged since the very earliest days of the universe. Identified about 25 years ago by radio waves, the ring cannot be seen in visible light. Only a portion of the Leo Ring has been imaged in the ultraviolet, but this section contains the telltale ultraviolet signature of recent massive star formation within this ring of pristine gas. 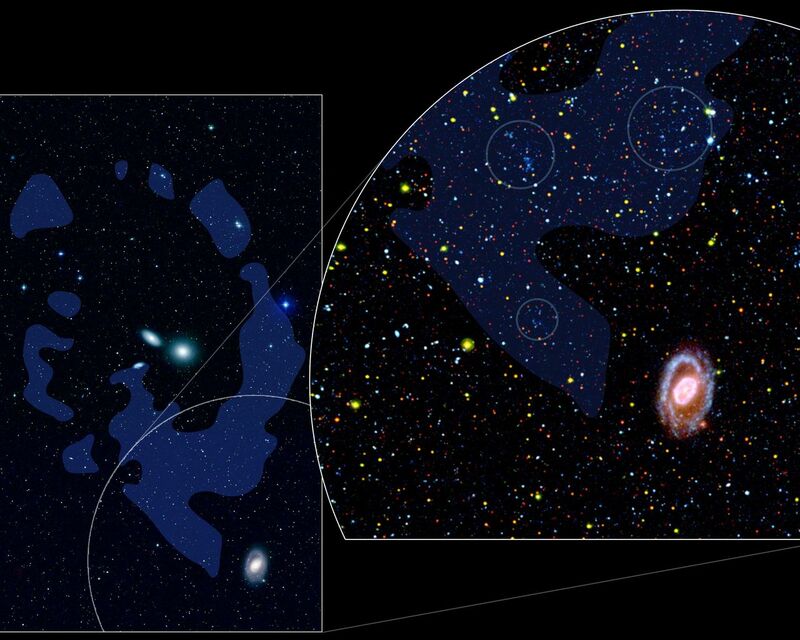 Astronomers have previously only seen dwarf galaxies form out of gas that has already been cycled through a galaxy and enriched with metals -- elements heavier than helium -- produced as stars evolve. The visible data come from the Digitized Sky Survey of the Space Telescope Science Institute in Baltimore, Md. 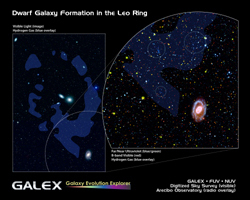 The Leo Ring visible image (left) represents the survey's blue, red, and infrared bands with the colors blue, green, and red. The overlay indicating the location of hydrogen gas in the Leo Ring is based on observations made at the Arecibo Observatory in Puerto Rico.